Maintain the perfect climate in your vehicle. Maintenance of your vehicle’s air conditioning system is important in order to keep it functioning properly and able to remove heat and humidity from inside your vehicle. The ability to defrost your windshield and windows, for safe driving, is also dependent on a properly serviced air conditioning system. 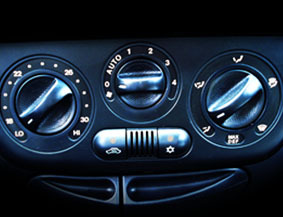 The air conditioning system service is a check for refrigerant leaks and the interior cabin temperature is evaluated. This helps provide a comfortable climate inside the vehicle and reduces the risk of premature compressor failure. When should I have my air conditioning system checked or serviced?